One thing I loveeeeeee about Christmas is spoiling friends and family with gifts - and my second favourite thing about doing that has to be wrapping said gifts! I've always loved wrapping presents as my Mum taught me how to wrap pretty early on, however, the older I got the more creative I got and I went from using simple printed Christmas papers to adding ribbons and patterns and bits and pieces. I thought as Christmas is fast approaching, I'd share some of my favourite gift wrapping ideas that we're using for our presents this year so that you can be inspired when it comes to wrapping your own - so let's get to it! But before you get started with the decorative stuff, let's start with the basics! Here's some tips for getting the perfect wrap! First you'll want to start with even edges. If your paper cutting skills aren't that fabulous or your scissors are hopeless, don't worry, there's a simple way to fix it! 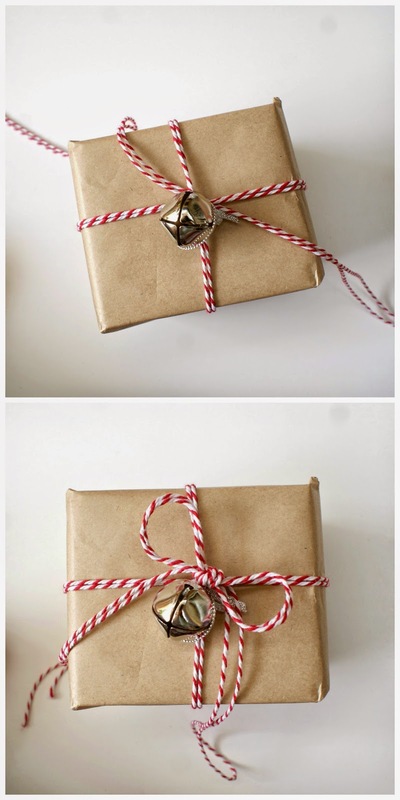 Simply fold over the outer edges of your wrapping paper to make a smooth edge! Next you're ready to wrap, after folding and securing the first two edges over your present, fold the side edges in as pictured. Next, fold up the bottom of your triangle shape to make a neat edge. Fold your bottom piece up to the edge of your present and secure with sticky tape. Then you're ready to decorate! But how should you decorate your presents? Whilst you could leave them as is, why not add a little something extra so that the presents look extra pretty under your tree! 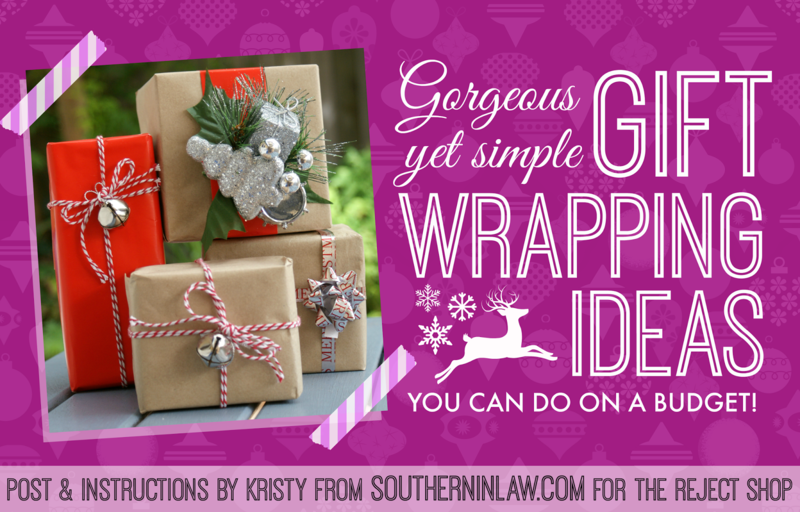 We've got a bunch of gorgeous gift wrapping ideas that you can do yourself on a budget! Jingle bells, jingle bells, jingle all the way...... We decided to add some festive bells to our gifts for something a little bit special and whilst they look impressive, they're so easy to do! The bells come in a set of 10 for the Reject Shop and are just $2.50 per pack! You'll find all of what you need to purchase to make these gifts in bold in the instructions below! 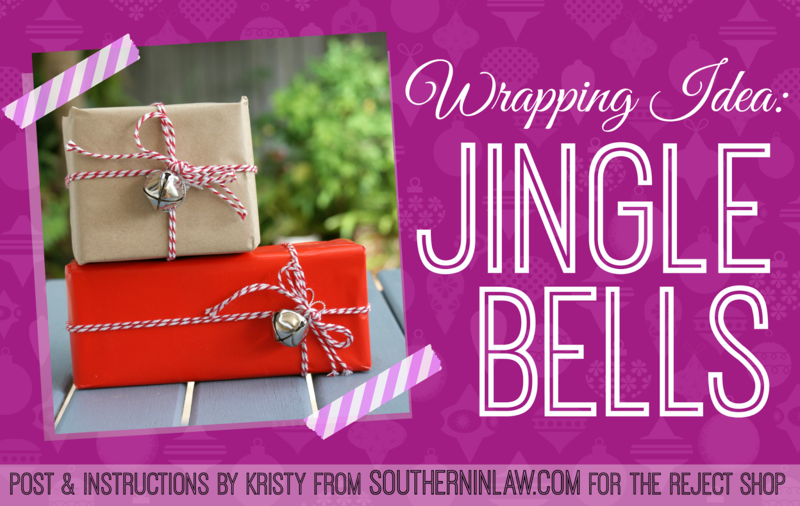 Next you'll want to tie a ribbon or some string to later attach your bells to. We chose to use Bakers Twine, which is just $4 a roll! First you'll want to tie the ribbon around your present - starting at the back, bringing your ribbon to the front and then taking it back around to the back to form a cross on the front. Then bring your string back around to the front, tying the ribbon in a knot at the point where the strings cross to secure it. Then it's time to add your bell! I left the little silver string attached so that our gift recipients could use the bell later on if they wanted to. We simply attached the bell by tying the excess string in a knot around the bell. Then all you have to do is tie the excess string in a bow (tucking in the silver string if you've kept it on) and put it under the tree! But what happens if you don't have enough excess string/ribbon to tie a bow? All you have to do if you run out of string/ribbon is add some more. For this brown paper package I decided I wanted a thicker double bow, so I simply added two strands of bakers twine by threading it under the cross and then tying it in a knot where the strings intersected. Then all you've got to do is tie your ribbon and you're good to go! 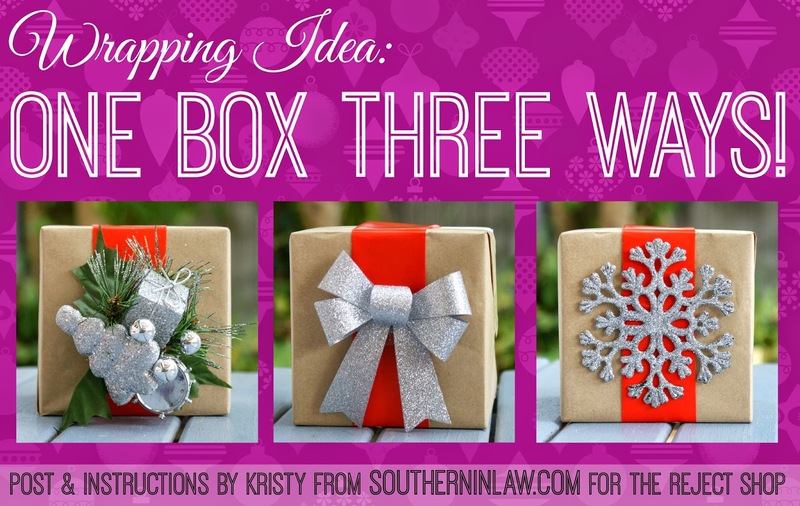 The next three wrapping ideas actually all use the same base box, but they all look completely different! First I'll show you the base box and then i'll give you ideas for taking that box and turning it into something unique! This idea is super simple, but super cute! At The Reject Shop you'll find sets of three glitter bows for $2.50 a set. They come with twist ties to attach them, however, we just used some double sided tape (or sticky tape folded over to be double sided) to attach them to our box. The Reject Shop have these great festive picks in store between $1-2 each. We went for the above one with silver sparkly ornaments attached which was just $2 and the perfect attachment for our presents. To attach the picks, you'll want to take your pick and bend the straight pick part sideways. Then all you have to do is tuck the open part of your pick under the ribbon/paper and secure it with sticky tape. I love the Snowflake Ornaments from The Reject Shop. They're just $2.50 for a pack of four and perfect for attaching to presents as all you have to do is add some double sided tape underneath! Small presents and gifts of money can be hard to wrap, but I've got the perfect idea for tiny gifts or money gifts this Christmas! 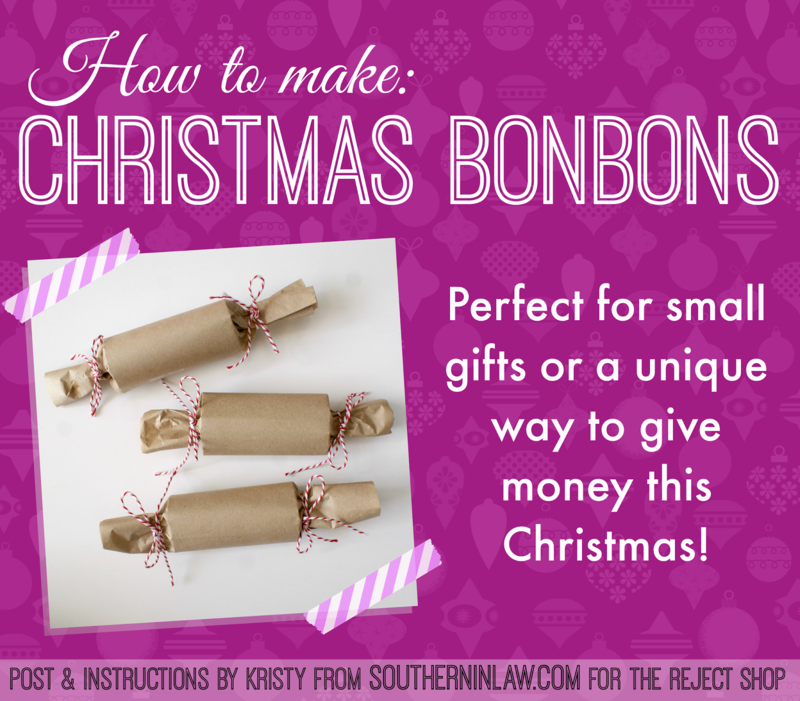 Instead of sticking money in a boring old Christmas card, why not try and make one of these super easy but super cute Bonbons! To make it super easy, I've put all of the items you'll need in bold, so be sure to get all of these first! First you'll need to collect some toilet rolls (empty ones, obviously!). You can also use paper towel rolls if you like and just cut them in half or thirds! Then you'll want to measure out enough brown craft paper ($2 per roll at The Reject Shop) or whatever paper you like to cover your bonbons, leaving excess on the outer edges (about 1-1 1/2") to make your bonbon shape! Next, using a sharp pair of scissors, cut the paper to size. Place your toilet paper roll in the centre of your square (not like the pictured :P) ready to wrap! Carefully roll the paper around your toilet paper roll, being careful to keep the edges even. After rolling your paper around your tube, secure it with a piece of sticky tape. Next, you'll want to push down one of the sides by pinching it slightly and pushing it with your pointer finger. Here's what it will look like when it's ready to tie. It's pretty simple but it might take a few goes to get the hang of it - remember you can always refold if needed! Then you're ready to tie! We used Red and White Baker's Twine from The Reject Shop ($4 a roll) which we tied with a simple bow and a double not for strength. Repeat the process on the other side of your bonbon and repeat the whole process again to make as many as your heart desires! 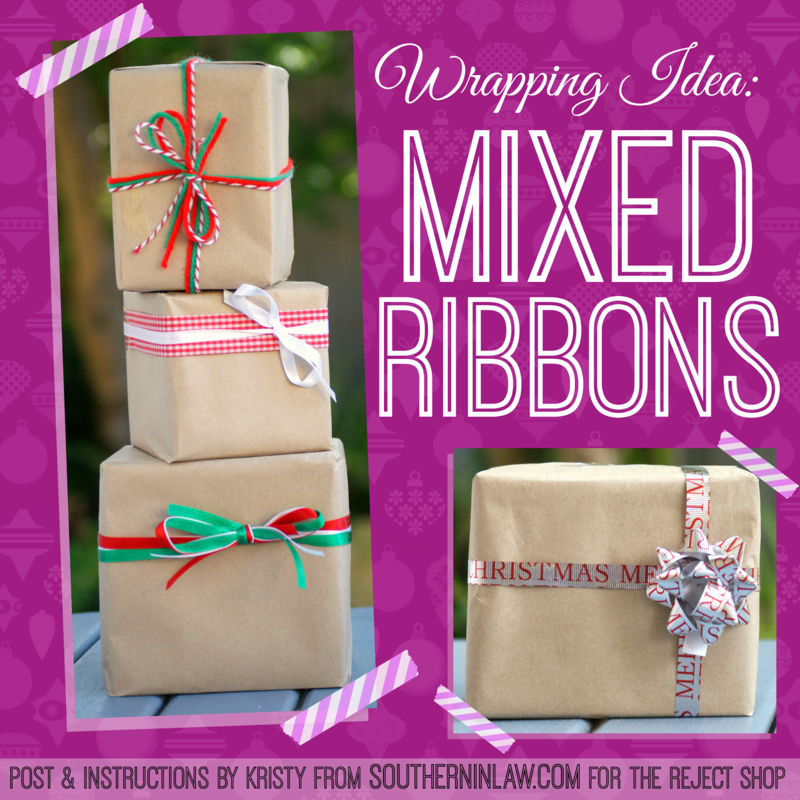 Another super easy gift wrapping idea is to use a mix of ribbons! Choose either a plain coloured wrapping or a print of your choice and go crazy with ribbons, string and yarn! We chose to wrap ours in Brown Craft Paper ($2 per roll) and then add a mix of different Ribbons in festive colours (Between $1-5 a roll at The Reject Shop) and yarn that we had lying around the house. I love the top present which combines yarn with Red and White Bakers Twine ($4 a roll) and The Reject Shop's Ribbon and Bows Set ($2.50 per set with 4 bows and 4 matching ribbon rolls) make it super easy to wrap beautiful presents! And there you have it! 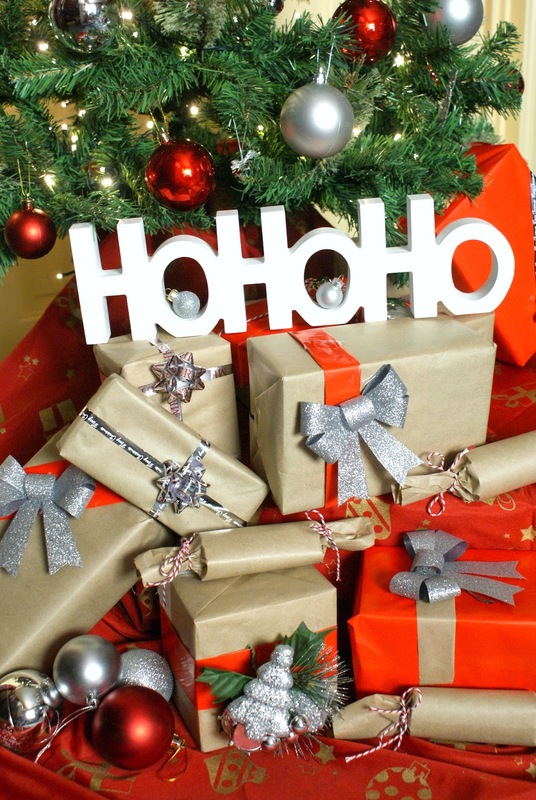 A variety of different gift wrapping ideas that you can do yourself this Christmas on a budget! Not only will they impress whoever is receiving your gift, they'll make your Christmas tree look even more beautiful too! But tell me, do you like wrapping presents for Christmas? What's the one gift you really hope to find under the tree this Christmas? Haha, it's always tricky - especially if you have an odd shape or wrapping papers that's too thick/thin!